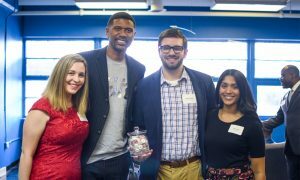 On Tuesday, April 11th 2017, Trinity Transportation was presented with the 2017 Lifesaver award at the Fate 2.0 appreciation dinner in partnership with the Jalen Rose Leadership Academy. 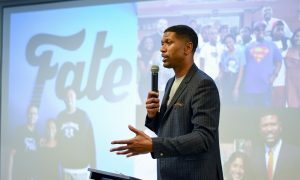 The FATE program is a four-year, cohort-based program for high school students in northwest Detroit. The program provides resources and opportunities for undeserved youth to embrace education with a goal to mo tivate each student to graduate high school and attend college. Twenty-two students from the Jalen Rose Leadership Academy were selected to participate in the 4-year education enrichment program. If they upheld program standards in GPA, Conduct, Community Service and Attendance, they were promised a $5,000 college scholarship at the end of the program. The students who participated in the program had a 100% graduation rate. 19 of the 22 students went into college and three went into the military or pursued work. Trinity Transportation provided free transportation for all students and staff to all educational purposed activities throughout the year. To learn more about the FATE program, Click Here!